Asher and Elon, both went to Milken, a Jewish Community School in LA Californina, both came on AMHSI and both enlisted in the IDF (with Elon still serving). Asher (left) is the older brother. He paved the way by coming to AMHSI in 2007. It was his idea and his parents were not understanding at first. “Why should a 10th grader travel to such a far away place with uncertain political situation?” they’d ask. However, Asher made his way to Israel with Milken and had the most incredible experience. He made aliyah in 2009 and served in Palchan Nachal for 3 years. After that he was accepted for his Bachelor’s degree to Columbia University and made his way back to the U.S. now living in NYC. He is a sophomore at Columbia with a dual major in Political Science and Middle Eastern Studies. Next in his future he sees a Masters Program in International Relations at Columbia University to which he will apply as early as next year. Asher has a clear goal of coming back to Israel and working in a role related to policy-making. He wants to play a role in Israeli politics, and so he is already making connections with various Israeli non-governmental think tank. When asked to name one organization he would love to work for, he cites the Peres Center for Peace. 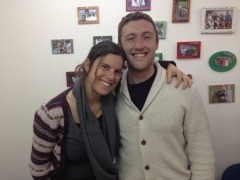 During his homecoming to AMHSI, he reunited with Chana Stein, pictured below, who was then his madricha (counselor) and is now the Hadracha Coordinator at AMHSI. Asher’s favorite memory from his time at AMHSI was Yam Le Yam. “Besides it being an awesome hike, you just realize how small Israel is; you can literally cross it in four days! That puts everything into perspective,” he added. “Also Jerusalem was very significant. I have always been a student of history. While everyone was asleep on the bus, I was watching the road closely with its pedestrians and armored cars, noticing all the things that historically brought us to where we are now,” said Asher. For him Jerusalem was a great reminder why Israel is so important to the Jewish people. His brother Elon came to AMHSI in 2010. He even started college at the North Eastern Univesity in Boston studying international business and international relations. 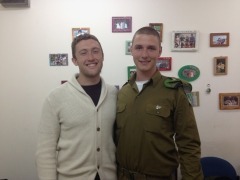 After finishing his freshman year, following in his brother’s footsteps, he made aliyah in 2013 and enlisted in the IDF. He is serving in the 50th Batalion in the Nachal. He is a voracious reader consuming a book per day (!) on his Kindle. The last book he read (which was just yesterday) was American Sniper: The Autobiography of the Most Lethal Sniper in U.S. Military History, a memoir by American United States Navy SEAL Chris Kyle. Elon is known as Elan (אילן) in his unit as he changed his first name upon coming to Israel. He didn’t like the way his name was spelled in Hebrew, איילון. He recounted a funny story that when applying for his Israeli passport, he had to change his name back because he wasn’t allowed to spell his name as Elon in the Israeli passport. After he had his passport in hand, he changed his name back to Elan (yet again). In the future, Elon sees himself as a writer. He started writing while at AMHSI. Every student is required to write a journal about their experiences, and Elon was particularly invested into his. When asked how AMHSI has changed him, Elon said that being in Israel made him think big. “For the first time I was free to make up my own ideas. Learning about Israel and Judaism in the U.S. is almost sterile. You need to be able to feel it, pick it up, struggle with it,” added Elon. Both brothers are swimmers and played water polo in high school. Elon ranked second in California in his day. Right now he doesn’t have time for swimming. The only free time he gets at the IDF, he reads. With Asher visiting, Elon took some time to go on a road trip with his brother. As they travel across the Israeli roads, they are amazed how much they know and recognize. “I still have a map of all the places we went to at AMHSI,” laughs Elon. “It’s amazing that between AMHSI and the IDF, we really seem to have covered pretty much all of Israel,” adds Asher.